Happy Friday, my friends! Zach is home because of a teacher curriculum day, Tyler has Preschool in a couple of hours and we have another busy weekend ahead ending with Travis and I doing our first Half Marathon on Sunday! I am really looking forward to it and I’m hoping Travis doesn’t have to drag me across the finish line! So keep your fingers crossed for me please! But in the mean time, the weather is cooling quickly in our area and I’ve been looking for an amazing Chili recipe that would blow me away for a long time and I think I have finally found one! This chili is most delicious! This one I found over at The Pioneer Woman and you just can’t go wrong with this recipe. Brown hamburger, then add garlic. Add tomato sauce, Rotel, salt, oregano, cumin, and chili powder. Cover and reduce heat to low. Simmer for 30 minutes. Mix corn meal with water, then add to the chili. Stir to combine and simmer for a final 10 to 15 minutes. Set aside. It has the right amount of meat, beans and flavor and was super delicious and I loved it so much that I made it for Tyler and Summer’s birthday party to put on top of hot dogs to have amazing chili dogs! And it was amazing! I also had bowls and fritos just in case you didn’t want to make a chili dog! So who is ready for Fall? How is the weather in your area? 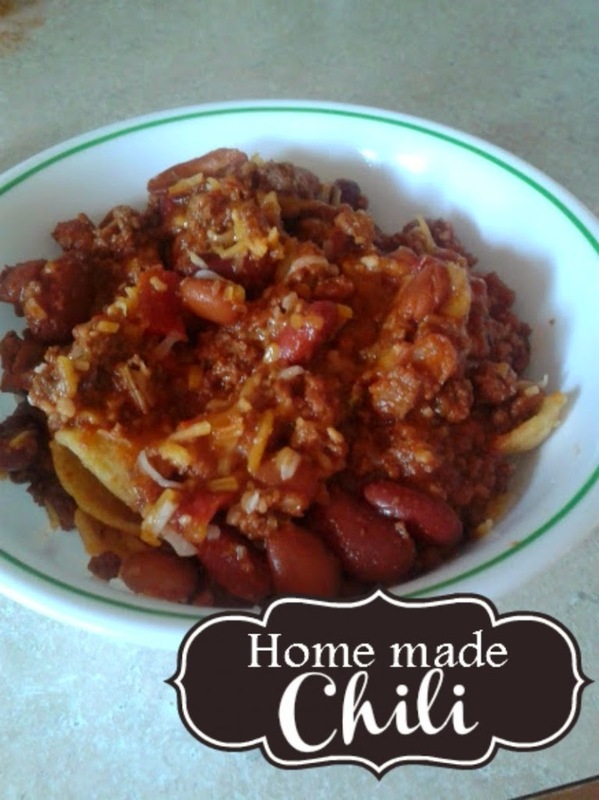 Love homemade chili…there is nothing like it on a cold damp day! Your recipe looks delicious. I use Rotel tomatoes in everything! 🙂 So glad you shared it with us at Foodie Fridays! I *thought* I saw Fritos in there! Chili can totally be a lazy man’s chip dip, I love it! Stopping by via Hump Day Happenings! I love Fritos so of course I had to include them! I did eat some of the leftovers that way with some scoops. It’s just too good to not do it! I love fritos with chili! Such a great combo for a rainy day. Thanks for sharing with Hump Day Happenings! Yes, it’s a great combo!